Kdan Mobile announced today that it has been selected as a Finalist for Red Herring’s Top 100 Asia award, a prestigious list honoring the year’s most promising private technology ventures from the Asian business region. Kdan Mobile, a mobile software application developer, announced today that it has been selected as a Finalist for Red Herring's Top 100 Asia award, a prestigious list honoring the year’s most promising private technology ventures from the Asian business region. As a global media company, Red Herring unites the world’s best high technology innovators as well as venture investors and business decision makers in a variety of forums, providing an insider’s access to the global innovation economy. Since 1996, the Red Herring 100 lists have been highly valued as an instrument to discover and advocate the private ventures with the most potential from different regions, including America, Europe and Asia. This year, the Red Herring editorial team selected the most innovative companies from a pool of hundreds from across Asia. The nominees are evaluated on both quantitative and qualitative criteria, such as financial performance, technology innovation, quality of management, execution of strategy, and integration into their respective industries. The candidate’s potential is complemented by a review of the actual track record and standing of a company, which allows Red Herring to see past the “buzz” and make the list a valuable instrument for discovering and advocating the greatest business opportunities in the industry. Kdan Mobile is one of the few companies that have been growing rapidly in the ever-changing and highly competitive mobile software industry. Until now, Kdan Mobile has reached more than 12 million downloads in the iOS market. The Company’s prominent mobile software solutions, PDF Reader for iPhone and iPad, have achieved a considerable number of iOS users in the market. The Company has also gained wide recognition owing to its efforts in innovation and R&D. With its global mindset, Kdan Mobile looks forward to continuing its success in the world of technology. "This year was very rewarding," said Alex Vieux, publisher and CEO of Red Herring. "The global economic situation has abated and there are many great companies producing really innovative and amazing products. We had a very difficult time narrowing the pool and selecting the finalists. Kdan Mobile shows great promise therefore deserves to be among the Finalists. 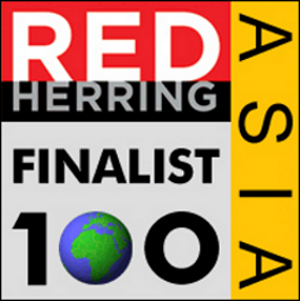 Now we’re faced with the difficult task of selecting the Top 100 winners of Red Herring Asia. We know that the 2012 crop will grow into some amazing companies that are sure to make an impact." “We appreciate the honor to be selected as one of the finalists and we expect highly of the winner announcement,” said Kenny Su, the CEO and the founder of Kdan Mobile. “Kdan Mobile has been dedicated to bringing innovation, professionalism, and high-quality services to the market. We are convinced that our technical prowess and dedication to innovative design will take us to the next level and to bring world-class products to the market. The accolades and the recognitions we received have helped us confirm that we have been on the right track,” added Su. Kdan Mobile Software is a company specializing in mobile application development. Kdan aims to bring a ubiquitous mobile operating environment to end users by providing innovative service and powerful technology. © 2012 Kdan Mobile Software Ltd. All Rights Reserved.